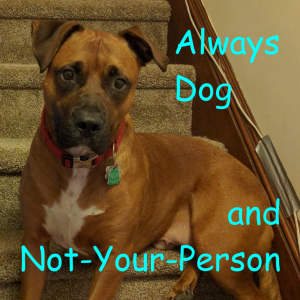 Always Dog and Not-Your-Person was an attempt to capture the inner spirit of being a dog. It is a game with 7 commands that all mean “vomit” (not to mention a variety of other biological necessities), so I am confident that I accomplished that goal. Always Dog is a resource management game rather than a puzzle game, so “fun” and “enjoyable” are technical terms. “Fun” is a measurement of things you do that make you happy, such as squeaking a squeak toy or chasing a rabbit, while “enjoyment” is a measurement of things others do that make you happy, such as giving you pats or giving you a dog treat. It is possible for things that are not enjoyable to happen, such as getting yelled at or having to go to the vet. These things are (distressingly enough) occasionally linked to fun things. For example, if you eat a dead bird (fun!) while the dogsitter is watching, you will likely get yelled at (unenjoyable) and you might throw up (value-neutral) which could result in a trip to the vet (unenjoyable). The lesson here: only eat dead birds when the dogsitter isn’t watching. Other stats in the game include health, hydration, bladder, satiation, and bowels. They all work about like you would expect, but if you’re super curious, I’ve posted the source code. This game contains 12 rooms and 50+ dog-specific verbs, all implemented to one degree or another. Of particular note, the map is rebuilt to represent dog awareness (no compass rose here!) and EXAMINE is, of course, a synonym for SMELL. You can bark to summon Not-Your-Person from room to room, and Not-Your-Person will occasionally comment on your behavior. In the original plan, you would receive a translated, timestamped list of Not-Your-Person’s commentary at the end of the game. The debug command COMMENTARY will give you a sneak peek at those results while the game is running. Major things unimplemented: Time progression. NPC reactions (based on the stats Concern, Affection, and Trust). Events and plot. The big things. But you can SQUEAK a fuzzy toy, should you find one. Because that is the true meaning of Being A Dog. Here it is, Ryan! Happy belated birthday.